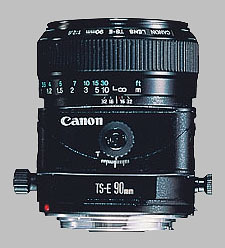 (From Canon lens literature) This is the world's first 35mm-format telephoto lens with tilt and shift movements. Gaussian optics give high-quality delineation and true background blur. The lens is suited for a variety of subjects, from products to portraits. Rented a 45 and didn't like the image quality. This lense was considerably better and tack sharp when not tilted/shifted. I have the 24LII, 85LII, 200 2L IS and nothing else. After using the TS-E 90, I figured it has every right to be in the same team as the above lenses. Although it's not an L-series lens, I have also used the new Nikon PC-E 85 2.8D ED Micro-Nikkor and the TS-E 90's build quality feels even slightly better. This is an exceptionally good lens. The sharpness is not short of amazing and what's even more impressive is the bokeh. The best thing about this lens is the combination of the above two points. Too often, new lenses don't have good bokeh because they have large apertures and manufacturers use aspheric elements to correct the spherical aberrations. Thanks to not being an overly ambitious design (relatively slow aperture and simpler optical design), it's blessed with very good sharpness and bokeh. I'm also willing to bet it even bests the new Hartblei Super-Rotator 80mm f/2.8 ("Optics by Zeiss" model) in terms of sharpness. The only thing I wish was different in this lens is the axis matter, like in the TS-E 24L II, TS-E 17L and Hartblei's Super-Rotators. The good news is this is a change that you can do at home and there are enough illustrations on the net on how to do it. From what I've read, the new (and equivalent) PC-E 85mm 2.8 Micro-Nikkor needs to be sent to the Nikon service center as it is a far more complex modification. This lens is superb optically. I use it mainly in the studio for table top shots. I found that it is far more flexible for small jewelry products than when I used a 100mm Macro, because of the tilt feature. I have used it with the 2x Teleconverter to achieve very close results. I don't miss the lack of Auto Focus, because my 30D, and 5D will give me the same focus point confirmation when I manually focus. I love the fact that the aperture is set on the camera (on Canons), rather than a on lens preset aperture style, like I had on my old Nikon 28mm PC lens. Even though they are vastly different in price, many photographers will wonder why not just get the "Lens Baby" to get that "tilt in and out of focus" effect. While I do own a Lens Baby for fun portrait work, they are great. But the Canon TS series is way more practical for product photo work, and except for the new 3G versions the LB's are almost impossible to repeat their effect. Anyone who shoots seriously should try renting this lens (or one of the oher focal lengths), and they will want to buy one. I also have the 45mm version, which I use for larger products, and general purpose location work, and am considering the 24mm one too. If you have never used a tilt and shif you should rent one. For pans vertical or horizontal you can just adjust the lens a full 30 in either direction, no need to mess with special heads, figure out nodal point etc. For interiors and exterior architecture (in wide angle version) just about all you need. Only down side is the manual focus, but with the tilt/shift thats kind of a nessecity. YOu should rent and try the above, a lot of pro's use these to get other wise very difficult shots.